Trust the team building professionals at Terrapin Adventures. Research has shown that team building is an excellent method to improve leadership and performance within a team. However, research has also shown that all of that effort can be for naught if the lessons learned during your team building outing are not reinforced. You see, team building is just like anything else. It requires practice. And just as one Spanish lesson is not enough to turn you into a fluent speaker, one team building session is not enough to enact long-lasting change. Terrapin Adventures recommends a follow-up session every three to six months to reinforce team building lessons and help maintain group performance. As researchers william J. Rothwell, Roland Sullivan, and Gary N. McLean explain, “Much of the research on team building suggests that teams that do a one-time team building session but fail to create any follow-up activities to reinforce what they’ve learned quickly regress to their previous behaviors.”3 The only way to sustain performance and change is through hard work and repeated team building interventions. These follow-up sessions are also an excellent opportunity to expand up those previous lessons and take your team to the next level. It takes time to enact positive, long-lasting change. “Team developmental interventions are key mechanisms that may be used to facilitate team effectiveness,” writes Raymond Noe in Employee Training and Development.5 Think about team building like a sculptor chipping away at a slab of marble. When all is said and done, that once boring slab of rock will become a beautiful work of art. Similarly, each team building sessions works to chip away bad behavior and sculpt your group into a high-performing team. It doesn’t happen overnight. Don’t waste your time and hard-earned money. Trust the team building professionals at Terrapin Adventures. Our experienced staff is able to design a program – onsite or offsite, indoor or outdoor – to help your group not only maintain high performance, but also increase their ability to problem solve, think creatively and collaborate with one another. 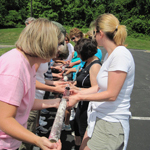 Schedule Your Follow-up Team Building Session! Coghlan, David, and Teresa Brannick. Doing Action Research in Your Own Organization. London: Sage Publications, 2001. Print. Salas, Eduardo, Lauren Benishek, Chris Coultas, Aaron Dietz, Rebecca Grossman, Elizabeth Lazzara, and James Oglesby. Team Training Essentials: A Research-based Guide. New York: Routledge, 2015. Print. Rothwell, William J., Roland Sullivan, and Gary N. McLean. Practicing Organization Development: A Guide for Consultants. Amsterdam: Pfeiffer., 1995. Print. Peragine, John N. 365 Low or No Cost Workplace Teambuilding Activities: Games and Exercises Designed to Build Trust and Encourage Teamwork among Employees. Ocala, FL: Atlantic Pub. Group, 2007. Print. This entry was posted on Monday, February 22nd, 2016 at 9:04 am. Both comments and pings are currently closed. You make a great point about how team building activities should be a continuing effort by management. People can spend a lot of their waking hours at work. Getting people to work together well can help increase job satisfaction, creativity, and productivity. I like how you mention that there should be a follow-up after an activity. That way you can see if activities were enjoyed and beneficial. Thanks for the post.